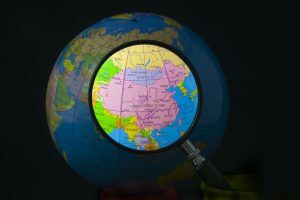 Spot LNG prices for East Asia soared during the four weeks from mid-May to mid-June, opening up a wide spread between the European and Asian gas markets, sufficient to encourage traders to look to sell reloads from Europe to the East. The ICIS East Asia Index (EAX) for July rose from $8.450/MMBtu to $11.400/MMBtu, almost beating the highest spot price levels seen in winter, with the front-month EAX having peaked at $11.613/MMBtu in mid-January. The global spot market was pulled up by strong demand from consumers in countries including China, South Korea, India, Pakistan, Mexico and Argentina. The strength of the crude oil market in recent months has made spot purchases look more attractive to Asian buyers with long-term, oil-indexed import contracts, who can buy spot cargoes to lower their overall average import price. Physical demand factors also played their part, with air conditioning requirements for summer peaks in east Asia, winter heating demand in South America and continued underlying growth in China’s rapidly expanding LNG market. Outages and delayed plant start-ups, meanwhile, impacted supply. Reduced loadings from Malaysia’s 29m tonnes/year Bintulu plant suggested some production problems there. Traders also reported work under way on the third 4.5m tonnes/year train at the US Sabine Pass facility, with feedgas flows into the plant seen to fall. Angola’s 5.2m tonnes/year plant is due to undergo maintenance in July. 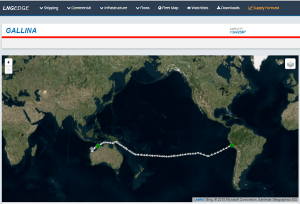 LNG Edge shows the 134,000cbm Gallina LNG tanker carrying a cargo from Pampa Melchorita in Peru to the floating Prelude vessel offshore Australia. The cargo was delivered in mid-June to start cooling down Prelude’s equipment as part of the facility’s commissioning process. The market has been waiting for new production to start up from a number of Australian projects. The floating Prelude project confirmed receiving a cargo of LNG to help with commissioning the facility, but has not yet produced a cargo of its own. The operators of Ichthys, a second floating production project, were heard in the market tendering to buy cargoes for July-September delivery to Asia, suggesting they needed to compensate for an expected delay in the start-up of their own output. But there was more positive news from the onshore Wheatstone project, where the second 4.5m tonnes/year train started production on 15 June, according to its operator Chevron. The EAX averaged $9.599/MMBtu over the period, up 21% from the previous month and 76% on the same period of the previous year, outstripping a 52% year-on-year increase in crude oil prices. The South America Index (SAX) was pulled higher by the EAX, averaging $8.748/MMBtu, as national suppliers including Argentina’s ENARSA and Mexico’s CFE had to compete against Asian buyers to secure the cargoes they needed for their heating needs during the southern hemisphere winter. The Northwest Europe Index (NEX) was much steadier, with Europe able to call on pipeline gas flows from key suppliers including Russia as an alternative to imported LNG. Europe had low gas storage levels in March and April after stocks were depleted by cold weather sweeping into Europe from Siberia at the end of the last winter: the so-called Beast from the East. But strong injection rates in the early summer months have already helped refill much of the deficit. With Europe looking more comfortable, the spread between northwest European spot gas prices and the EAX widened from just over $1.00/MMBtu in mid-April to around $4.00/MMBtu on 15 June, when Asian spot cargoes were assessed at $11.40/MMBtu for July and $11.50/MMBtu for August. This has encouraged cargoes from Russia’s Yamal LNG project to switch onto new ships at European ports for voyages further east, rather than delivering straight into European ports, as had become more common in April and May. Europe received four Yamal cargoes for domestic consumption in April and five in May, while only two were received outside Europe in those months. Yamal cargoes are also expected to start arriving directly in Asia via the Northern Sea Route through the Arctic in coming weeks, now that the ice that blocks that route in winter is thinning. The price spread has also incentivised traders to look to reload volumes of LNG stored in European terminal tanks onto ships to carry east. Ballast vessels have started heading to terminals such as Montoir and Fos Cavaou in France and Gate in the Netherlands to either transfer Yamal cargoes or pick up reload cargoes. Traders in Asia have reported reload volumes being marketed in the region. Prices in the emerging LNG swaps market indicate strong demand could continue in Asia until next summer, with monthly contracts all priced over $11.00/MMBtu until April. Swaps for Q4 18 Asia delivery rose almost two dollars over the past month, from trade heard at $9.85/MMBtu on 14 May to $11.80/MMBtu on 14 June. 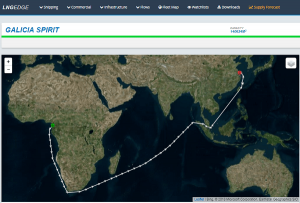 Notable voyages during the past month included the first cargo produced from Perenco’s floating project off the shore of Cameroon, carried by the 141,000cbm Galicia Spirit to Jiangsu Rudong in China. It arrived on 14 June. The Cameroon project is the world’s second floating LNG production unit, after one launched by PETRONAS off Malaysia, which delivered its first cargo in 2017. The 177,000cbm LNG Sakura on 21 May delivered the first long-term contract cargo for Japan from the US Cove Point facility. It was delivered to Tokyo Gas at the company’s Negishi terminal. Tokyo Gas and Kansai Electric can both receive cargoes under the deal. The 152,000cbm British Diamond on 31 May delivered the first US LNG cargo to Israel’s Hadera port. It was carried by BP from the US Sabine Pass plant. BP normally supplies Israel with cargoes from Trinidad & Tobago. The 170,000cbm Pskov on 1 June delivered the first cargo from Russia’s Yamal LNG project to reach China, to Tianjin port. The cargo was first taken from Yamal to Zeebrugge in Belgium on an ice-breaker ship, then left Zeebrugge on the Pskov on 2 May. Chinese companies invested heavily in the Yamal project. The first direct cargo to China heading east through the Arctic is expected to set out in coming weeks. Alex Froley follows the global LNG markets as an analyst at energy markets information provider ICIS. As well as following the latest market trends in pricing and trade flows, he is working on the development of new features for the company’s analytics platform LNG Edge. Alex has over fifteen years’ experience in the wholesale energy markets, with a particular focus on European gas and electricity trading and the rapidly-expanding market for spot LNG. He has worked as a price reporter assessing markets including the UK NBP and Dutch TTF gas markets, the German electricity market and Asian LNG and has been responsible for real-time news, daily and fortnightly publications about the natural gas industry. He has also worked as a European gas analyst tracking supply and demand data for gas flows across Europe. 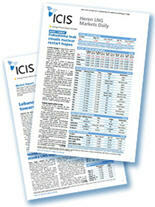 ICIS is the world’s largest petrochemical market information provider, with divisions spanning energy and fertilizers. Our aim is to give companies in global commodities markets a competitive advantage by delivering valuable information and analytics tools which enable our customers to identify and react to opportunities in markets which are constantly evolving. We have more than 30 years’ experience of providing pricing intelligence and news, forecast data, market analytics and independent consulting to buyers, sellers and analysts. With a global staff of more than 600, ICIS has employees based in London, Houston, New York, Singapore, Dubai, Shanghai, Guangzhou, Beijing, Mumbai, Tokyo, Karlsruhe, and Milan. ICIS’s team of journalists is engaged in reporting market prices and news, and ICIS is fully committed to upholding the highest journalistic principles of verification, corroboration and authentication. ICIS has a compliance framework that along with its methodologies and business processes adheres to the requirements of the IOSCO PRA Principles. ICIS is a division of Reed Business Information, part of Reed Elsevier Plc. Unique LNG price points, providing users with daily tradable prices for spot LNG delivered into East Asia, and Middle East and North Africa respectively. ICIS publishes the most extensive list of global LNG spot price assessments (22 DES, 12 FOB, East Asia index), historical prices, charter rates and availability, together with daily news, market alerts and industry analysis. 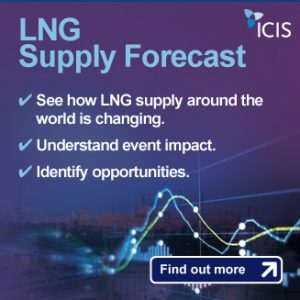 ICIS provides unparalleled pricing and market intelligence for China’s LNG/natural gas markets. Our reports coverage include LNG China import and domestic prices, supply-demand data, investment opportunities in China, local legislations and more.